In 1891, another slot machine type emerged in New York which consists of five drums with each drum containing 50 cards which was derived from the game of poker which was a very popular game at that time. The slot machine was created by Sittman and Pit and it became such a big hit that soon every single bar has a slot machine on their establishment. The next stage in the slot machine history was the introduction of Fruit Machines which happened after co-operation with the Bell-Fruit Gum Company in 1912. The card symbols on the reels were replaced by fruit images . 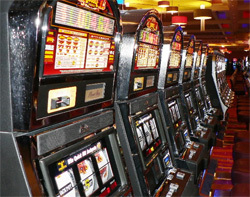 The electromechanical era dominated the mid-twentieth century – are rather dull period when it came to slot machines. The highlight of this period was the release of Big Bertha, who was soon upstaged by her big sister, Super Big Bertha. This super slot cost more than $150,000 to make, was powered by a five-horsepower motor, and had 8 reels with 20 symbols on each one. Super Big Bertha certainly was a spectacular machine, but it wasn’t very advantageous for the players. It only paid back 80% to the players, and the chance of winning the jackpot was 1 in 25.6 billion. 100 years ago, slot machines were known as "bell machines" or "fruit machines," because if 3 Liberty Bells appeared, you won a piece of fruit-flavored gum. 80 years ago, the mob controlled most slot machines in existence, and during that time, slot machines were known as "one arm bandits" because the payback percentage was terrible -- roughly 50%. A little over 10 years ago, the first online slot machines appeared, and since then, their popularity has exploded. Online slot machines have payout percentages in excess of 95%, which is higher than what you will find at most land-based casinos. The selection of online slots is huge, and it continues to grow each month. Nowadays players can play a variety of casino slots at online casinos. The beginning of online slots history is marked by the Free Trade & Processing Act passed by Antigua and Barbuda in the Caribbean in 1994. That act allowed companies from all around the world to open Internet casinos legally. Microgaming was the first software company that started developing software for online casinos. The first Internet casino Gaming Club was launched in 1995 and the second one, InterCasino, opened in 1996. The industry developed very quickly and the number of software companies and online casinos offering different games grew every year. With the aim to protect and support online players well-known Canadian Kahnawake Gaming Commission was established in 1996. Most of the players preferred to play online until the United States Senate passed Unlawful Internet Gambling Enforcement Act in 2006 which banned wire money transactions to and from casino accounts. Still many internet casinos accept US players. According to statistics, today slots create about 70% of the whole income of any online casino.